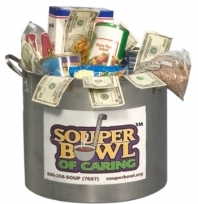 The “Souper Bowl of Caring” is held yearly on the same Sunday as the NFL Super Bowl. During the weeks preceeding the Super Bowl, members are encouraged to “tackle hunger” in our local community by bringing in canned goods and other non-perishable food items. On the actual “Souper Bowl Sunday”, soup kettles are also in place with the competing football teams’ logo and worshippers are encouraged to cast their votes for who will will with cash donations collected in the kettles. A football toss competition for different age groups is also held with the nominal entry fees going to the cash kettles. 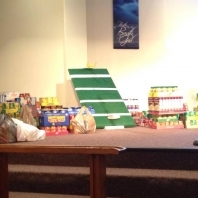 In 2017, $345.50 and 1115 items were collected to benefit the Agape Food Pantry which serves Sidney and Shelby county residents.